First I want to say cudos to 'pmknipp' and he gets the "great attitude" of the year award, more on that in a second. He meets me at my pad 0500, we hit the road for uncharted waters in search of newness and feathers. We get there, get to scouting, almost get stuck, see a lot of PP and don't hear any calls or see any boids. So it's like well, um....now what? I feel bad. It's his first year hunting, I'm having the slowest start ever in my life, I'm wondering how long it's gonna be before he wrings my neck. So we bail for a lil secret spot I know a couple hours away hoping the birds got a late start. Big covey 10' from the truck, bust a cap to get them going the right way and not back onto PP and we have several nice pockets of birds to kick up. We've been driving for almost 6 hours so I'm a little bleary and miss the first few shots, but the kid is on the board right away. We are having a gas chasing, spinning, whatching grey blurrs whizzing all around just laughing like kids, then settle down and start connecting. We bag a few and loose one in a really large juniper. We can see her and she's still alive with a broken leg or something and it's just too tight for even me to get into so....we leave her to chill out some and the others to regroup, switich spots and go chase some Jacks. Come on on back about 40 min's later and our cripple's still there, I mean wedged into the base of this tangled mess. I strip off my gear and go in after her but she keep's fidgeting and won't let me grab her and it's just too tight and tangled to get much father, the kid's a big feller and no way was he getting in for her. We spent at least a half hours trying to get her out- each time literally inches out of reach. So I had to put her down with a shot. She didn't feel it but I still felt bad for her. Maybe a 'yote will make good on her but at least she wont suffer. Sorry gal, you deserved better. We tried the spot twice and the second pass the wind came up and, well, they were back flushing with the wind and pretty gone after that so....still, a great day after a pretty sucky start. It's great to see the light in a new hunter's eye, I know that exact feeling and I still get it everytime one goes in my belt. Nothing like a one shot drop on the wing, nothing. So anyways we had a great day wingshooting, busted a bunch of caps and smiles were all around. The kid's sharp and handles a (pump!) gun very well for a rookie and he can hunt with me anytime. What a positive attitude. Very disciplined and respects the land and game. Good guy. 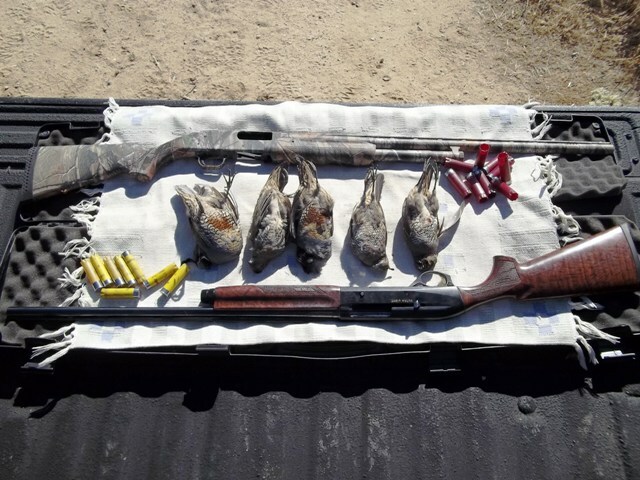 So- here's a shot of our meager take, not indicative of the FUN we had...Nice FAT valley's, a swamp monster Mossberg pump 12ga (gotta love that sound) and my 'cadillac gun', the Benelli bird buster Ultralight 20ga. (the big male went 8oz after cleaning!) all taken on the wing between 25-45y. I see 17 empty shell casings, where are the other birds? We missed a lot of birds and Jack's. Plus I picked up some empty's that weren't ours. And If I tag a bird I'll keep plugging it, these things HAUL when they hit the ground runnin' so I like an insurance shot so they don't get away. We each shot a box. Our second pass at the birds were all misses, I was just too tired to connect but...still a ton of fun. I got some nice fat males in the fridge right now too...I mean the big male on the left is one of the plumpest I've ever taken of this species, he's a tank! Had to hit him twice to anchor him. The Benelli cycles wicked fast. A big congrats Stovey. I knew with your persistance that you would succeed. Those are some fine looking birds, and I'm sure very tasty. Sounds like a very tough hunt to me. You did well. Those 20 ga's are a great bird gun. Wouldn't use anything else to hunt birds with. Keep them hunting stories coming. Good luck on your next hunts. great to hear you are finally on the board. looks like you have a worthy companion to hunt with in the future, he may just be a lucky charm too. hope they taste just as good as they look. Way ta go Stovey...like I said in Round 2...you is a patient man...I knew you would get on top of them. A damn fine looking "flock" you got mate. Proud of the way you looked after the injured "girlie" too mate...you are a humane hunter. Sounds like you have a hunting partner for many a year to come mate...teach him well and be proud. El- was thinking the same thing, lucky charm. What a positivie attitude too, good guy to be around. I'm looking forward to my next hunt with him. Two get birds better than one and it's fun to share the hunt with someone like him. Vinny- thanks mate, appreciate the humane compliment. We got her to the edge of the juniper, I ran back to the truck and got my gun and was going to sluice her but I was too close @ 20y or so and missjudged my pattern and the thickness of the cover and she got poofed. But she was out of trouble at least and we never gave up on her, spent an hour total trying to get her but she would'nt let us so I put her down so she wouldn't suffer and I felt a little better then. I feel I owe it to our game to be as humane as possible, at least that's how pop raised me- stop the hunt, save the game and do everything in your power to recover it. He wa stotally on board with that too so we click on a lot of points. You can pour some of them "simmerings" over my rice peeloff. Copy that bossman! Comin' right up! Very nice presentation of those birds Stovey. Looks like some good shooting along with some fine cooking. So who prepared this fine looking meal? Very Nice! Cooked it meself....was trying out a new recipe. 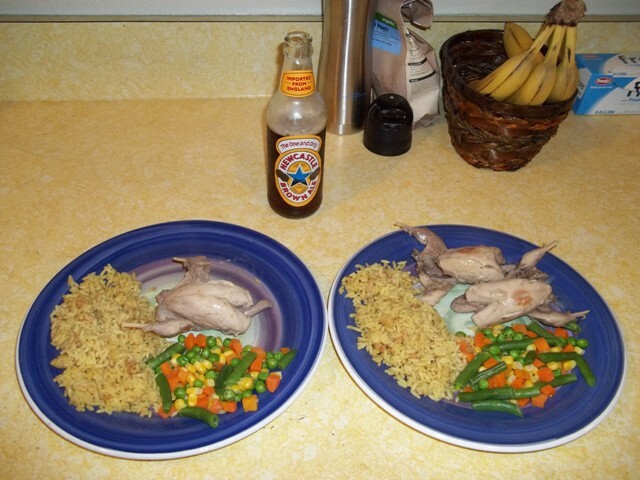 Turned out OK, couldda used more rub on the birds though. Twas the current Lady Stovey's first quail fest... she was a lil nervous at first...but she liked it. Showed her pics of the take. First time she'd ever seen where her food came from.